Red Maids are tiny annuals with spreading and branching stems. Blooming time is from February to June. These plants range from California down to Baja California and out towards Arizona. This plant favors a disturbance (edge of a trail - which is where you are going to find 99% of these flowers) and is a known fire follower. I have gone by these flowers in the early morning and late afternoon and have noticed that the flowers were not opened up. Best time to take photographs seems to be after 9 AM and before 4 PM - possibly a result of ambient temperature and amount of sunlight... Something to know! The pink-magenta flowers are 3/4 inch in diameter with five petals and numerous white-yellow stamens. They appear at the tops of the stems in a leafy raceme. The hairless alternating lance-shaped leaves are light-green, 1 to 3 inches long and spaced sparsely up the stems. Recent genetic analysis has lead to the reclassification of this plant - until recently known as Calandrinia ciliata. This analysis indicates that this plant is distinct from the red maids found in South America who get to keep the name many of our local flowers books still reference: Calandrina ciliata. Red Maid seeds were highly valued and eaten by Chumash and other native peoples. Seeds are known to be rich in dietary fats and at one time before the arrival of Europeans, Red Maids grew much more extensively - all that invasive grass pushed a considerable amount of our native plants out of the way. The plants were ripped out of the ground, left to dry then threshed to remove the seeds and stored in a basket. The seeds could then be eaten or ground into flour. The Chumash were known for setting fires to the grasslands to encourage the growth of Red Maids. If you are interested in more this kind of information, be sure to purchase a copy of Chumash Ethnobotany by Jan Timbrook. The seeds were also used in ritual offerings as well. Another author, Philip Sparkman - The Culture of the Luiseño Indians, 1908, stated that Luiseño people also ate the shiny black seeds and the tender young greens. 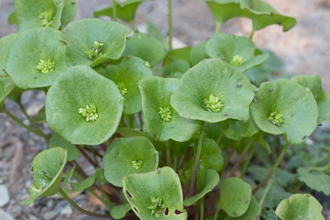 This plant is related Miners Lettuce, and the two plants could be used together to make a pretty good salad. Name Origin:The genus Calandrinia refers to Jean-Louis Calandrini, a Swiss professor in the 18th century. The species name menziesii refers to Archibald Menzies, who was a Scottish surgeon, botanist, and naturalist. Last modified: October 14 2017 15:07:33.